Commemorations will be held on the Thames today to mark 50 years since Sir Winston Churchill's funeral. Havengore will retrace its route down the river with all of the former Prime Minister's family members on board. Tower Bridge will be lifted and a gun salute will take place as it passes HMS Belfast. Officers who were present at his funeral 50 years ago will place a wreath in the water opposite the Palace of Westminster. Back in 1965, 350 million people watched the televised journey of Havengore carrying the coffin along the Thames. 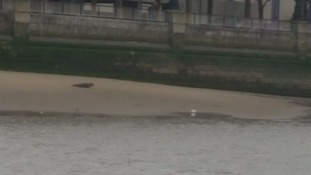 A grey seal has been spotted taking a swim in the River Thames near Teddington Lock. Andy Butterfield saw it while working for RNLI Teddington, he took to twitter to track the mammals movements. Mr Butterfield has said whilst it isn't common, seals do swim up as far as Molesey Weir. Video footage has captured the moment a giant hippo was seen floating down the River Thames this afternoon. From the man who created the giant Rubber Duck, Florentijn Hofman today showed Londoners his newest masterpiece- a 21-metre-long hippo sculpture. 'HippopoThames' is the first UK commission from the renowned Dutch artist. A memorial service will be held today to mark the 25th anniversary of the Marchioness riverboat tragedy. 51 people were killed when the boat packed with partygoers when it collided with the dredger Bowbelle and sank in 1989. The names of the dead will be read out at the service at Southwark Cathedral. Two launches will also be provided to allow families to drop flowers at the spot on the river where the accident happened. The secluded 3.72-acre island, where it is believed the great charter was sealed by King John, is going under the hammer for almost £4m. Quick-thinking members of the public managed to rescue the cat, who has now been named Arial, after the "distressing" incident in the water. The rivalry between Cambridge University and Oxford University continues with the annual boat race on the River Thames this afternoon. Cambridge is desperate to deny Oxford its fifth Boat Race victory in seven years. Since the races began back in 1829, Cambridge has won 81 times, while Oxford's victory tally stands at 77 races.